There are several key points to bear in mind when selecting a colocation data centre provider. Here our expert reveals mistake he's made, in the past, and how to avoid them. Editor's Note: This is part two in a series of articles on common mistakes made when choosing a colocation data centre provider. Check out part one here. After I made the decision to hire rack space from a commercial provider, the first company I went with turned out to be a misstep in a number of ways. I have named that provider "Colocation-R-US" and from that bad experience, I've developed a checklist to share with others so they don't make the same colocation blunders when choosing a data centre provider. While scoping out a new supplier after firing Colocation-R-US, it became clear why Colocation-R-US had such strict rules about site visits and why it was so punitive when I wanted to arrange off-hour maintenance visits -- the ideal time for performing intrusive work: The owners of Colocation-R-US were running a "dark site". That's a term I hadn't heard until I subsequently began working with a quality colocation data centre provider, Node4 Ltd.
"Dark site" is the term used to describe a location where rack space is provided, but the site is not staffed 24/7. Instead, the support staff clock off at normal office hours and the site is operated with either very few or no members on the premises. Colocation data centre providers that operate in this way often pay their staff a nominal extra amount of money a month in exchange for being "on call". Since my colocation data centre hosts a non-business-critical lab configuration, I would very rarely raise a ticket at 3 a.m. in the morning to ask for "remote hands" assistance. In the one occasion I did, it was because I was in the US and the time difference was such that it was very early in the morning in the UK. After I made the decision to hire rack space from a commercial provider, the first company I went with turned out to be a misstep in a number of ways. After learning that Colocation-R-US was operating as a dark site, it did explain why the person on the other end of the phone sounded like I had woken him from his comfortable bed -- because I had. It also helped explain the punitive costs I had to pay to carry out maintenance during the weekend: My colocation data centre provider had to cover the unscheduled overtime of employing a staff member to be present when I arrived. So how do you know if your colocation data centre is operating as a dark site? The first step is to ask them bluntly and see if they squirm. It was my mistake never to have asked this question of Colocation-R-US. Another way to tell is during your site visit. Generally, professional colocation data centres will have a dedicated space to house their staff -- which works on a shift basis at the data centre -- with an impressive array of screens, seating and refreshments. Look for this type of set up when visiting potential colocation provider sites. Rarely is such an investment made for dark sites. 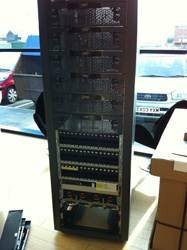 If your initial requirements are quite modest, you might be tempted to lease half of a conventional 42U rack server. This is especially true of folks who want to relocate a small number of noisy 1U or 2U servers that they have in a home lab. A half-height rack is not unlike a house that has been split into two apartments. You might not currently have anyone living above you, but you could in a few weeks or months. Whilst most colocation businesses like to have some "slack" in their halls, any unallocated space is a cost for their business and a lost chance to make some profit. So they are keen to fill these spaces more often than not. This raises issues of security and availability. Some racks are fitted with a single door from U1 to U42. That makes it impossible to secure your equipment from access from another person. Not only could someone use this physical access to breach your equipment from a security perspective, but also, and even more important, someone else's stupidity could be the cause of an outage. Literally, another business could accidentally uncouple one of your systems from the network. The other issue -- of availability -- affected me personally. 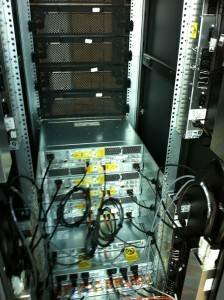 Initially, when I moved into "Colocation-R-US" I had just four 2U servers and one 4U SAN unit, together with the usual prerequisites such as an Ethernet switch and a firewall. Later on I was lucky enough to receive enterprise storage from both EMC and NetApp on a long-term loan. Sadly, by then the space above me in the rack was already occupied. The only short-term solution (apart from leaving Colocation-R-US altogether) was to completely re-rack my kit and move to another rack a couple of feet away. As you well know, once a system is cabled up and functioning, the last thing you want to do is relocate it. I'm hoping this is a very basic issue that most IT professionals are aware of. You would think a rack, is a rack, is a rack, but in the world of colocation data centres, you might find equipment that's mounted in your own environment doesn't fit into the colocation data centre's infrastructure. Although there's a document (EIA-310) defining a standardised 19" rack, there is great variance in this standard. Most colocation places I have visited use square holes for mounting equipment, but occasionally I've found that the OEM rail kits use round pegs for their mounting screws. For example, Dell's RapidRails only work with square holes; whereas Dell's VersaRails work in round non-thread holes. All the EMC hardware I've ever had the pleasure of loaning comes with their own rails attached, and in some cases are shipped in a rack of their own. EMC storage comes with round-screw heads that don't fit the square holes at the back of most racks. Whilst this isn't the end of the world, you might find yourself having to unrack and uncable equipment to fit into the racks provided by the colocation, and in the process of moving a kit from one rack to another, a screw or mounting post can disappear down inside the rack or under floor cooling ducts. Most racks in colocation data centre sites are adjustable -- and in my new colocation at Node4, the staff was very helpful in lugging my kit into the rack and doing the necessary adjustments. Note: These two photographs show the front and rear of the rack containing the new EMC NS-120 that I have on loan. Node4 helped me unrack it and re-rack it into the location in the data centre. It's storage, not a server! Going back to my experience at Colocation-R-US, it often used to drive me nuts about the sales and technical staff there: They were unable to distinguish servers from storage. Yes, it might seem an obvious distinction to you, but at many colocation sites, you will find rack after rack filled with 1U and 2U commodity servers. I think this might give the game away to some degree with the less quality-oriented environments. Their staffs are often geared up to filling their space with servers, not storage arrays, and this can sometimes be a pain point from a power perspective if your rack is skewed more towards storage than servers, as was the case in my situation. This distinction is a minor one, but it irked me that even after taking the plastic cover off a storage array and pointing at the vertically mounted disks, the folks there would still insist that my storage was a server. In the world of corporate environments, most people measure their power consumption by the Kilo Watt Hour (Kwh). There are a couple of reasons to do this: Most OEM equipment is rated this way, and you are billed in this format by the power generator that supplies your location. However, in the world of colocation data centres where the infrastructure is sold by the rack and the half-height rack, the measurement of choice is the AMP. The main reason is that colocation data centres use the AMP meter that exists on most power distribution units (PDUs) to measure your actual usage. Additionally, they must take care that one consumer doesn't draw more power at the expense of another. So on top of PDUs, circuit breakers are there to ensure your kit doesn't draw more power than expected. As a consequence you will see most half-height rack packages sold with an 8 AMP allocations, and most 42U racks sold with a 16 AMP allocations. The ratio of AMPs to rack is based on the assumption that you will be racking up more servers and network equipment than you will storage equipment. Storage is more power hungry from the perspective of disk spindles that are constantly turning night and day. So, if you are storage top-heavy, as I am, be careful about calculating your AMP rating. You may find that a 16 AMP allocation to your rack is insufficient, which means you will have to buy AMPs at increments decided by your provider. In some cases, providers sell by small increments in the range of 0.5 AMP to 1 AMP; in other cases, they sell in blocks of AMPs such as 2 AMPs to 4 AMPs. This can be an unexpected cost to your colocation data centre plans. If you are lucky, you may be able to measure the amount of AMPs your kit will pull from an existing infrastructure as in the case of re-location to colocation. If it's your first time, however, and your hardware has been running via a domestic supply or in a small office, you might be totally unaware of the AMP rating. Don't assume that if you need more power you can simply demand it. Asking for more AMPs can be difficult. For a start, the number of power sockets available from the PDU may be limited; the AMP rating of your PDU/circuit breaker -- or even just the total amount of free power in your particular side of the location -- might make turning up the AMP dial more difficult. So you might find that you need the PDU or the circuit breaker upgraded or you need an additional PDU because you have run out of sockets to plug equipment into. Also be wary of the AMP rating. It varies depending on the load. In my case, my lab environment is not in production use, so the AMP measurements are relatively steady and linear, but the same cannot be said of production environments. What are the dangers of not calculating your AMP ratings correctly? Well, you could have problems charging up the onboard UPS systems that some storage ships with automatically. You then run the risk of blowing fuses or exceeding the rating of your circuit breaker. If you're shopping for a colocation data centre, and you think you might have power requirements that exceed the normal expectations of the provider, make your sales rep and technical staff aware of this at the earliest opportunity. To find out more common mistakes made when choosing a colocation data centre provider, click here for part three of this series.